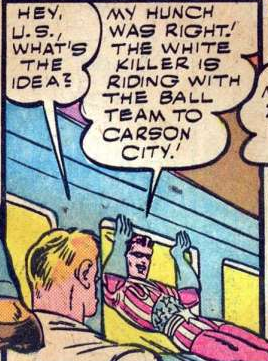 Bizarre Baseball Culture: What does “The White Killer” have to do with Baseball? 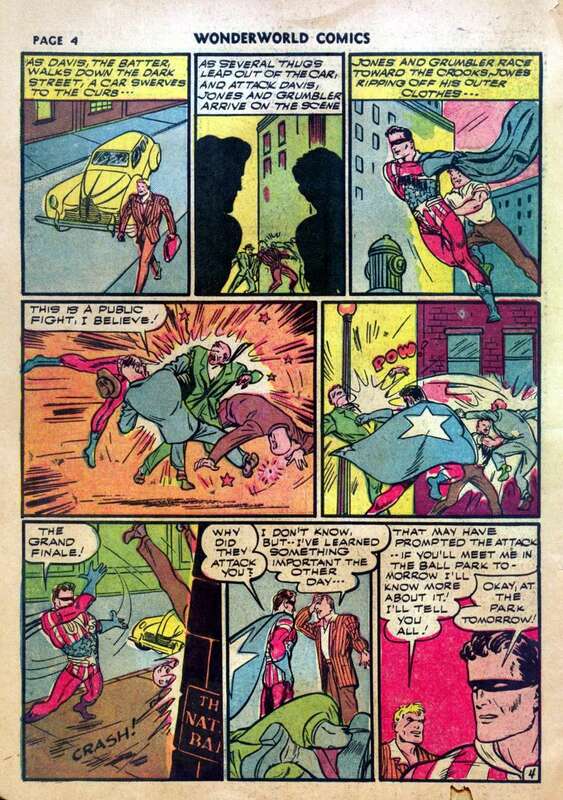 Way back in the ninth installment of this series, I mentioned how one of the archtypes of superheroes is the patriotic hero. 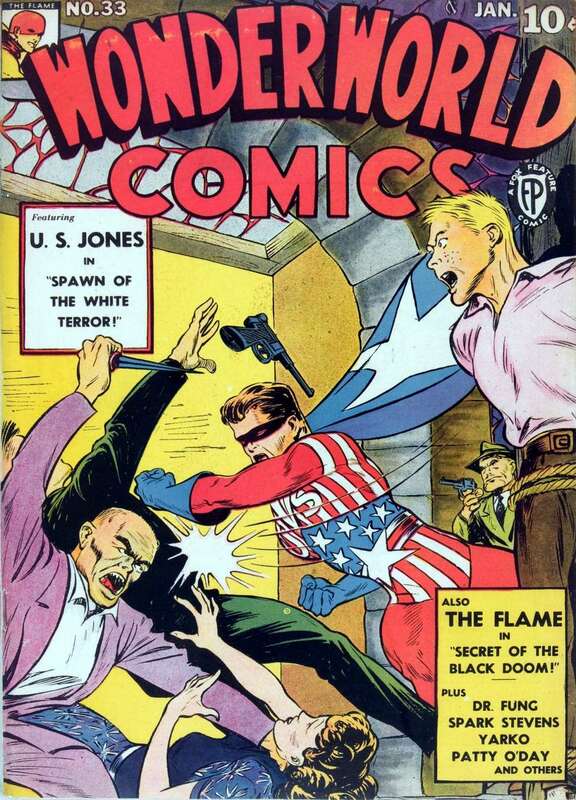 The most notable, of course, is Captain America, but there have been others: The Shield (who starred in that comic), Uncle Sam, Miss America, the Fighting Yank, etc. Wow, what a horrible costume. It’s somebody ate an American flag and then vomited upon Jones’ skin. And then there’s the U and S upon his chest. You know, in case you didn’t get that he was themed for the United States of America by the fact that his costume looks like he did stuff to a flag forbidden by the US Flag Code. 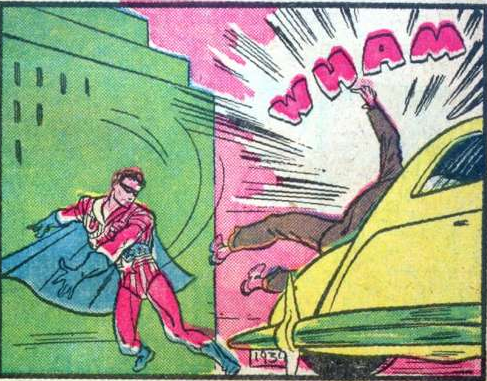 Anyway, the comic, from Wonderworld Comics #33, can be found here. It is in the public domain. Go below the jump for more. 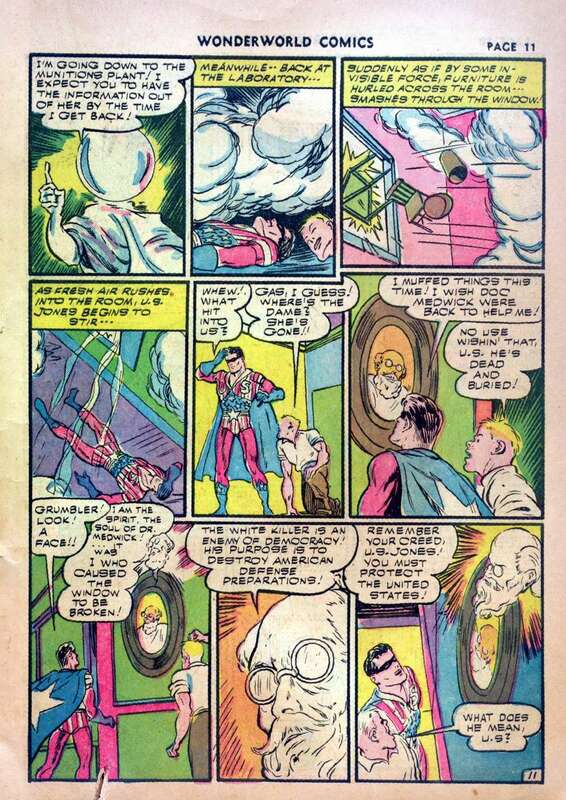 So, some background on the people responsible: this January 1942 comic was done by Bob Farrow and Louis Cazenueve. My research says that Bob Farrow was a pseudonym for Robert W. Farrell, who later ran a minor comic book company called Farrell Publications. Louis Cazenueve was an Argentine-born artist who did art for B-list and lower superheroes in the 40s, most notably a few years of Aquaman in the mid-40s. What’s weird about this story is that the story is basically the same as a bunch of other stories from the 1940s, only there’s baseball randomly thrown in. 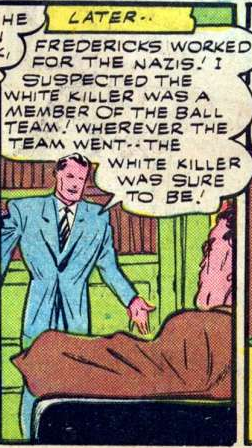 We open with a splash page showing a later scene that asks a question: WHO IS THE WHITE KILLER!?! Anyway, Jones and Grumbler are told to head to Carson City, site of a defense factory and “some things” that Jones has noticed in connection to the deaths. What are those things? They never really say beyond some talks about a “hunch” and things he “suspected”. But that’s some stuff for later. Now, Carson City, clearly, is a much bigger deal in the world of US Jones than it is in the real world and appears to be your standard large northeastern city instead of the capital of Nevada. In fact, it is such a big deal that the famed “Blue Socks” baseball team is headed there, as can be seen when our heroes see the Socks’ manager, Mr. Fredericks, get on the train. Before you know it, the White Killer makes an appearance on the train and tries to kill Jones. A quick change uniform change later, and Jones is ready to take down the Killer… only to find he’s already gone. 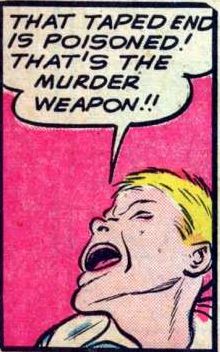 But don’t worry- he’s happy at his utter inability to catch the killer, because it means… his hunch is right. Why does he think it is connected to the ball team? He never says, really. And he seems awfully chipper for having failed to stop a killer. There is then this sequence, where US Jones and Grumbler save Blue Sox batter Davis, who gets attacked kind of randomly after he speaks to his skipper Fredericks. And Davis says he has learned something important, too: Of course, he then proceeds NOT TO TELL THEM, proving that US Jones and Grumbler are hardly unusual in their stupidity. No, he says he’ll have more to tell them tomorrow at the ballpark. Nevermind he could probably tell them what he knows so far just to get them up to date and possibly allow them to investigate a bit on their own. But hey, what do I know? Gee, the White Killer sure knows a lot of stuff about Davis and the fact he knows stuff. Given that the only people we’ve seen talk to Davis are Jones, Grumbler, some random goons, and Fredericks, it clearly is one of them. Spoiler alert: It isn’t Jones, Grumbler or a random goon. Oh, did I spoil that for you? Too bad. At the ballgame the next day, Davis is held up by some thugs who want him to skip the game, not play, etc. 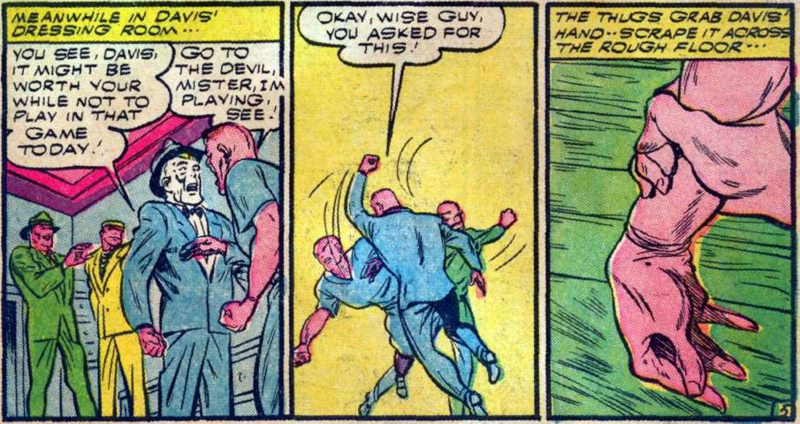 When he refuses, they rough him up and the comic makes an unusual amount of attention to the fact that they scrape his hand against the floor. 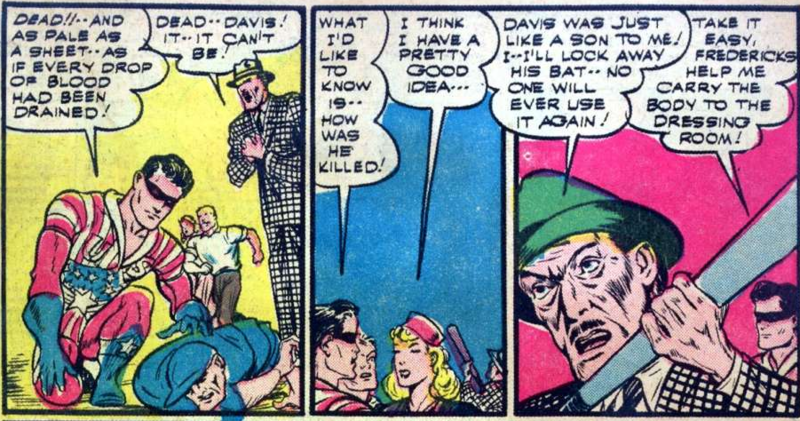 He’s left unconscious, but soon Fredericks shows up and not only tells Davis he’s going to play, but that he has his lucky bat! Why would Fredericks just randomly have Davis’ bat? Why, that isn’t suspicious at all! 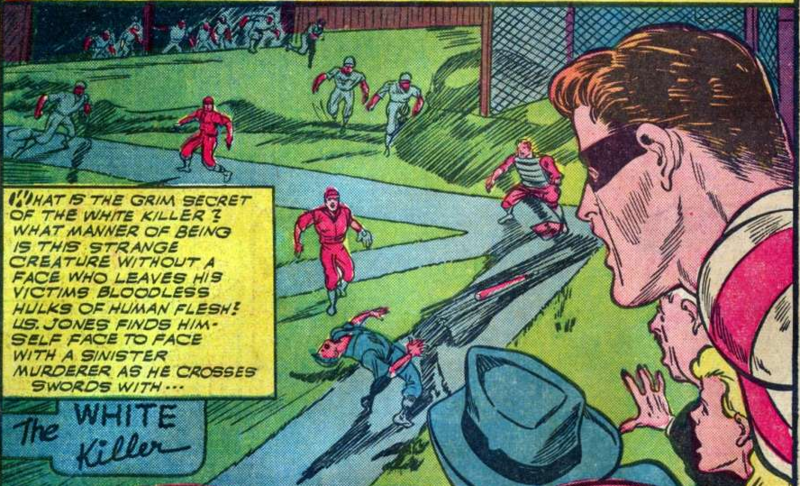 Also, this continues the trend of ignoring injury and concussion in these old-time baseball comics. Yeah, Davis just outright dies while running the bases out of nowhere. Jones remarks that is is as if every drop of blood was suddenly drained from him. Sadly, there are no vampires in this story, so the question is: What could have caused this? And how? Who is behind it? Yes, the bat is poisoned with something that infects people through open wounds. Hence why they showcased Davis’ hands getting scraped against the floor earlier: they opened the wounds that got infected with the poison. 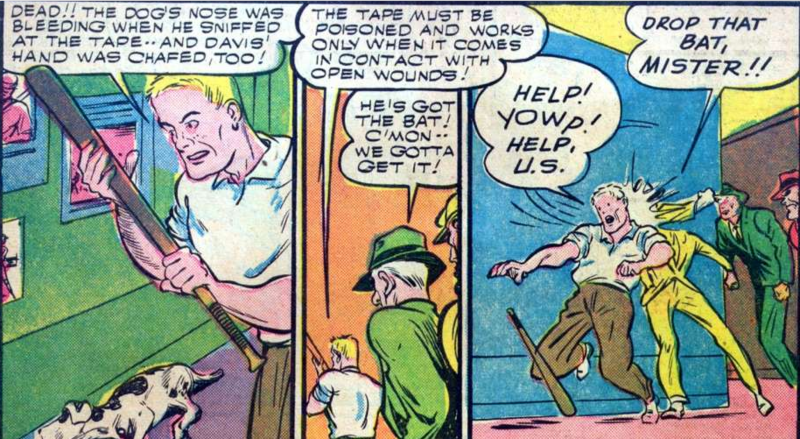 So, anyway, Jones goes and beats up the thugs and gets the bat back. Nanette (the icky girl with cooties from earlier who is JUST TRYING TO DO HER JOB YOU MISOGYNIST FOSSILS!) says that a chemist had invented a new drug that destroyed red blood corpuscles, with the implication that the White Killer stole it from him. I’m trying to think of any use for a drug that destroys all the red blood cells in the body, but I can’t really think of any beyond “chemical weapon”. Jones wants to analyze the poison, but for whatever reason the only lab that might help him is the lab of the late Dr. Medwick, the doctor who gave him his powers (whatever they are). 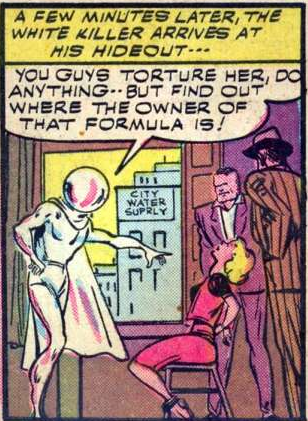 Not exactly the best continuity when you can’t even keep the gender of your villain straight. Thankfully, this is getting close to wrapping up. 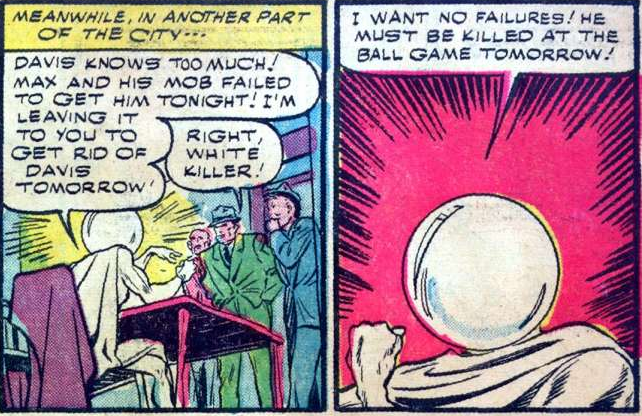 After Jones and Grumbler are SAVED BY THE GHOST OF DOCTOR MEDWICK (seriously), they go save the day (the plan: Jones stopping the killer, Grumbler saving Nanette), and SHOCKER- the White Killer is Fredericks! Oh, but wait, there’s more! Turns out that Grumbler gets into trouble and Jones has to save him to… he does. The end. That’s great, Jones, but THERE’S NEVER ANY REASONING GIVEN BEHIND THIS THEORY!?!?! Did the killing line up with the team’s schedule? That has to be it, right? Well, it is never really stated. Probably because this story is dumb and there’s a reason why nobody remembers U.S. Jones in any way! Next Time on Bizarre Baseball Culture: Rerun. 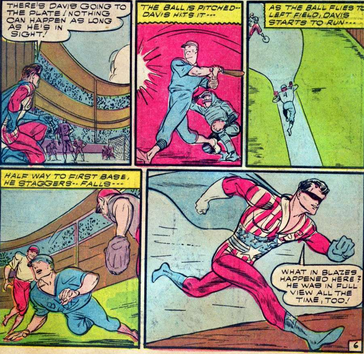 This entry was posted in Baseball, Books and all their spinoffs, Non-Baseball, Uncategorized and tagged baseball, Baseball comics, Bizarre Baseball Culture, Comic Books, comics, Grumbler, Jones, superhero, US Jones, white killer, Wonderworld Comics by danglickman. Bookmark the permalink.